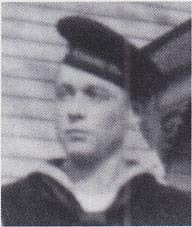 Keith Warren Tipsword, Petty Officer, born June 21, 1914, Moccasin, Effingham County, IL, began service Nov. 3, 1936, at Great Lakes NTS, where he was for three months. On graduation, he was assigned to the USS West Virginia on which he served for the rest of his life. At the end of his first four years, he extended for two years, returning home for his last leave. During that visit he explained, "If I get out now, we will get into war and I'll be recalled, which will disrupt my marriage and my job, so I decided that if I extend for two years, by then it may be over, and I can get out and live my life as I wish." He served successfully, was promoted to machinist mate 1/c, but lost his life during the Japanese attack on Pearl Harbor, Dec. 7, 1941. His life and death have been featured in a one-hour video titled They Served With Honor, made by Craig Lindvahl, Effingham, IL, for Public Broadcasting and distributed nationally, and more recently, internationally. Submitted by his sister, Gayle, Tipsword Norris, and Robert A. Ehm.